Sponsored by Thomas Gardner Society, Inc.
One purpose for this blog is to look at things technical. So, we have looked at code, CMS, and more. The scope will run down the whole axis of technology. And, of late, we got involved with DNA. The TGS blog has two posts that are of interest: DNA and genealogy plus Admissibility. The former started a list of references. One focus has been to find early papers dealing with motivations and approach. The latter looks at issues related to the admissibility of scientific evidence into the legal process. One thing of real concern would be black box handling of data with results that were not amenable to analysis. Come to think of it. We see all sorts of genealogical software about which we do not know much. But, then, many of these thrusts are more oriented to making money than to our desires to honor our ancestors. Be that as it may, we also have an issue of wholesale adoption of DNA as the latest truth wizardry. Recently, the NEHGS periodical used the correct language. In the sense of a study, a relationship was marked as predicted. You see, that recognizes the statistical nature of a lot of the processing. Too, assuming that averages are given is not what we need in our modern, complicated world. 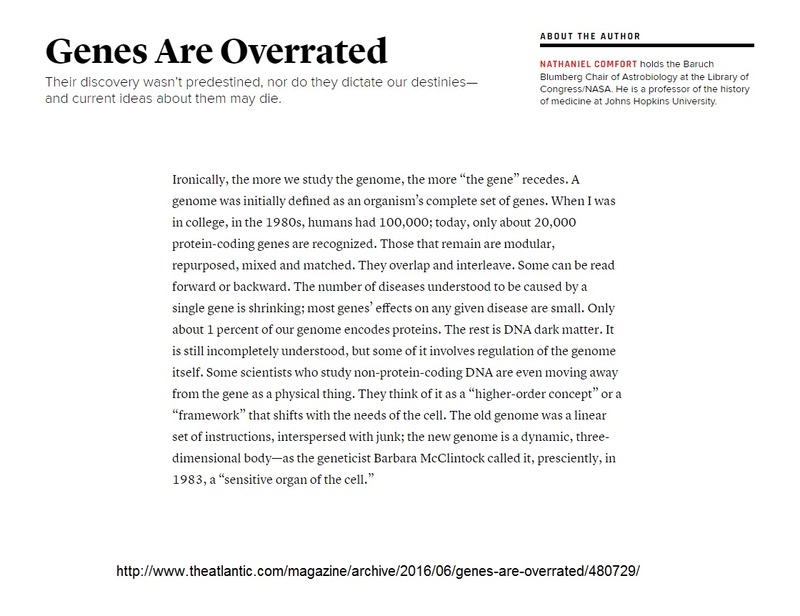 The below image comes from an article (The Atlantic) titled “Genes are Overrated.” In the same issue, there is an article that explores the question: Is there free will? If your genes determine your self and your actions, what ought we think about our future? Good point. Genealogy’s use of DNA deals with a simple matching. But, one can well imagine more involved uses that are under consideration. This is not unlike the growing interest in predicting genetic propensity for disease or madness or whatever. Yet, we are pushing this awful fast. For me, the underlying analysis is sure making use of computational advances that are poorly understood. Everywhere I look, I see issues albeit we have had people making oodles of money. At the same time, problems have become more troublesome. Lots to discuss with this. For this article, the author used “DNA dark matter” in an attempt to suggest that we know a whole lot more than the press tells us. But, then, when are they really believable? One obvious error would be to find strong causal links when there are many other genetic factors involved with some observable trait. But, that type of wrong thinking is prevalent in business with its process minimization that tries to reduce down to some small set of contributors in situations that have way more nuances than are allowed into the scope of things.